Farm Bill 2018 Hemp Special Report | What’s Next for Hemp? 2018 Farm Bill Special Report: What’s Next for Hemp? The hemp industry experienced a seismic shift with the passage of the 2018 Farm Bill: Cultivation of hemp is now federally legal, and so is hemp-derived CBD. But, what does this mean for the industry? Where are the new business opportunities? 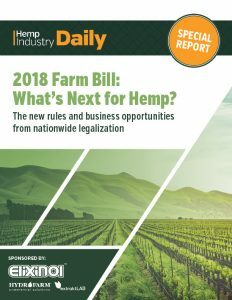 How will federal oversight by the FDA and USDA impact growers and manufacturers?Hemp Industry Daily breaks down the new rules for you in our SPECIAL REPORT on the future state of the industry, 2018 Farm Bill: What’s Next for Hemp? This is the expert analysis for the hemp & CBD markets you need to quickly – and wisely – take advantage of the new landscape. Verified analysis has been hard to come by in the hemp industry, but the researchers and journalists of Hemp Industry Daily makes our unique industry access available to you through exclusive interviews, trusted data, and proprietary market projections. Don’t get left behind in a haze of understanding policy – access this FREE report and start making informed, data-driven decisions for your hemp business now. Trusted by cannabis experts, media groups, decision-makers and professionals around the world, MJBizDaily provides timely and accurate resources for sales information, market analysis and employment trends in cannabis.